Coming Soon: The V.C. 's- Raid On Caliban. Courtesy of one-man comics machine David Broughton. 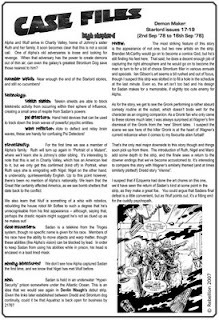 Hi all, and here we go with another collection of reviews for the new issues as well as any bits of news while I think of it. First off- Small Press Day was a blast. Myself and NanoBolt attended at both 'The Comic Shop' in Macclesfield and Nostalgia & Comics back in the wastes of Brum on the day. Macc was a grand trip. It was great meet Dan, catch up with Chris and see a proper nice comic shop. We sold a few comics, talked some nonsense and left the shop with stock of both the Zarjaz summer special and the latest issue of FutureQuake. Nostalgia & Comics is the closest thing FQP have to a 'home' shop so it was a treat to be able to sit and actually chat to the staff and other SP dayers there. We met up with Steve of TimeBomb Comics, who was selling copies of Flintlock, which has some lovely lettering if I do say so myself and got to have a nice long chat with long time collaborator Roland Bird, who provided NanoBolt with a sketch of the Legion of Superheroes 'Lightning Lass.' Roland was knocking it out of the park with his sketches that day. 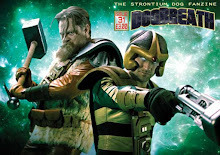 Dave Broughton has been in touch to let us know that he was interviewed on the AWESOME COMICS PODCAST. I really do need to make time to listen to this, as Dave is a great conversationalist and a comics making machine to boot! 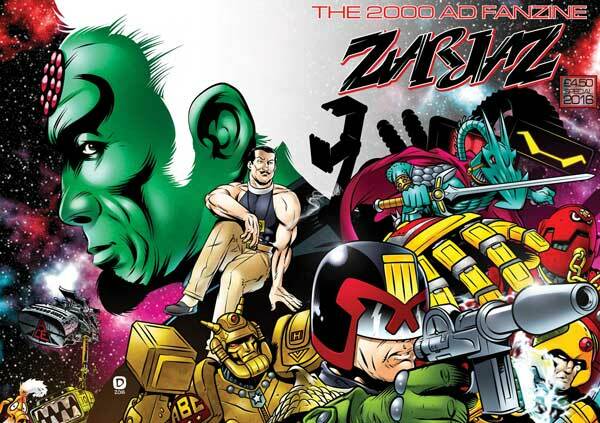 Other news while I think about it: We have sold out of copies of Zarjaz 05, 19 & 20. There are currently no plans to reprint those issues so a huge thanks go out to all those who either contributed or purchased a copy of those issues! I'm sure there is plenty of other stuff I've not thought of, but once I do- I'll post it here! Seeing as there are only two days to go till Small Press Day, think it worth reminding folks that this is a vital part of the UK comics scene these days and should be supported. 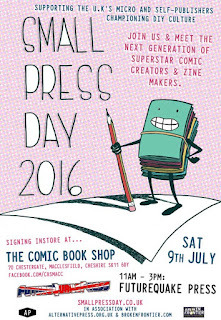 There are events all over the country- Visit http://www.smallpressday.co.uk/ to see the updated list of what is going on. I'll be at the Comic shop in Macclesfield between 11 and 1 (or thereabouts depending on traffic) before heading back to the Brum wastes to join in with a massive list of creatives taking part at Nostalgia & Comics between 2-3. I'll have the latest issues of FutureQuake and the Zarjaz summer special with me, as well as a few copies of the Neroy Sphinx trade. Drop by and say hi. 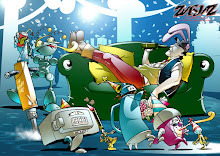 Cover by Nigel Dobbyn- click to see a larger version. It’s the summer, so what better way to celebrate than with an oversized edition of the Galaxies greatest fanzine! Zarjaz goes A4 for a summer like no other! Inside the pages you will discover new stories for Judge Dredd, Devlin Waugh, the ABC warriors as well as Strontium Dog and making his Zarjaz debut- NEMESIS THE WARLOCK. 48 pages for the astounding price of £4.50 including a full colour centrespread! Only £4.50, you don’t deserve it! Available from the link on the right.